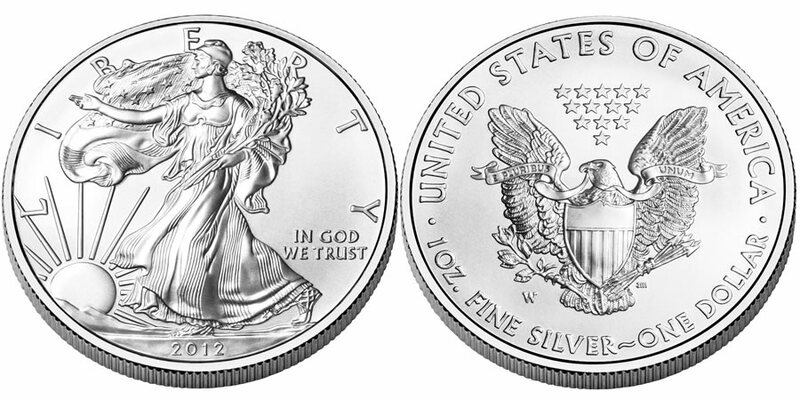 The 2012 American Eagle Silver Uncirculated Coin will appear for the second year in a row with the release of the 2012-dated strike from the US Mint. Each coin is composed of one ounce of .999 fine silver with a diameter of 40.60mm. The series itself actually dates back to 2006 when the Mint first struck an Uncirculated Silver Eagle. However, the coin was cancelled from production in 2009 and 2010 as the Mint struggled with unprecedented demand for the bullion version of the strike. Bullion demand remained intense in 2011 leading some to wonder about the uncirculated Silver Eagles appearance that year. However, the US Mint had been working with its silver blank planchet providers to increase available supplies allowing the Mint to return to production of the numismatic Eagle. Adolph A. Weinman's "Walking Liberty" design is featured on the obverse of the Silver Eagles. It is considered by many to be one of the most beautiful designs ever struck on a coin and debuted with the 1916-1947 half dollar. Obverse inscriptions include "Liberty," "In God We Trust" and the year. The reverse contains the image of a Heraldic Eagle with Shield and was designed by US Mint Engraver John Mercanti. Reverse inscriptions include the words "E Pluribus Unum," "United States of America," "1 Oz. Fine Silver" and "One Dollar."